A classic supernatural showdown cuts the Face Off field to the final three. Last week’s non-elimination challenge lead directly to this week’s second part. Each artist has to make a werewolf that is the nemesis of last week’s international vampire. Sounds good. This was a mostly uneventful episode. George had trouble with his injured wrist, and Tyler had a crisis of faith (in himself), solved when Michael and McKenzie went out of their way to encourage him. Mr. Westmore had a ton of really excellent, specific advice this week. Since he’s been doing the weekly mentor bit, he has not given a single piece of bad advice. George “won” the episode with his werewolf evolved from vampires. It was cool, especially that bulky, muscular neck with the slash wounds. George also recovered nicely from a last minute model change. George’s ideas always seem shaky to me. They never look good as sketches. But his final creation almost always wins me over. Tyler created a super convincing and realistic werewolf. It was very traditional, although Tyler chose to focus on a more human face. He did a great job bulking up the model to maintain the proportions. I liked Rashaad’s design best this week. He did some very cool things melding Asian design flourishes into a traditional werewolf face, plus making it seem like it could fling fireballs. It’s true that the chest was too plain, and virtually unpainted. A far worse offense were those bright red pajamas. They destroyed any sense of power or dignity that werewolf may have had. Niko’s werewolf was pretty weird. It looked more like a fish man to me, or maybe a werechihuahua. I thought his vampire with the grisly tongue was much better. 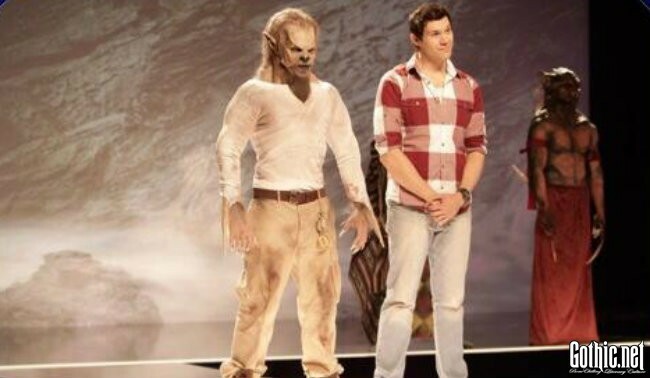 I’m not sure I’d have eliminated Niko based purely on his vampire and werewolf (maybe, maybe not, it would be close), but overall I think the strongest three contenders have made the finals. I’m pretty sure Rashaad has this locked up. Posted by Ed Grabianowski on Tuesday, April 15th, 2014. Filed under Dark TV, Headline. You can follow any responses to this entry through the RSS 2.0. You can skip to the end and leave a response. Pinging is currently not allowed.